← Mechanics of Creation 3: Super-Sizer Poses Post! That’s drawn by Jack Kirby, by the way. Jack Kirby is cool. But when it comes to licking the pants off someone you can bet………!!!!! Please PM for Names, Numbers,and Address. A one time fee will be applied to your credit card. 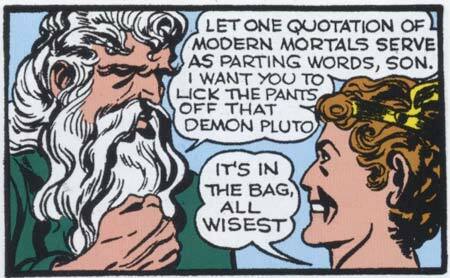 Aw, it’s so cute when the gods try to use modern slang. But don’t laugh. If you laugh, you get a thunderbolt in a very uncomfortable place. Did they actually say stuff like that in comics? Where’s the comics code when you need it? What? You didn’t know Pluto often wears edible undies? The announcer would say that after hockey players thwacked the wristwatch around the ice for a bit, then held it up to the camera for proof. That was just one commercial.